Ah.. this is a REAL treat. There is little about this dish to be disliked. It contains wild garlic leaves which are so strong that you need extra strength toothpaste for the next forty-eight hours (in itself no bad thing), pine nuts - which I find all disappear not long after using the required amount for the recipe, and a good drizzle of extra virgin olive oil. When I discovered that garlic leaves are available on Ocado at the moment, I couldn't help but order. It's one of those ingredients that feels a bit elusive and worth grabbing when you get the chance. I bought it without really being sure what I'd do with it but as pesto is one of D's favourite sauces (apart from dratted ketchup - he does NOT get that from me... thanks Mr K...!) 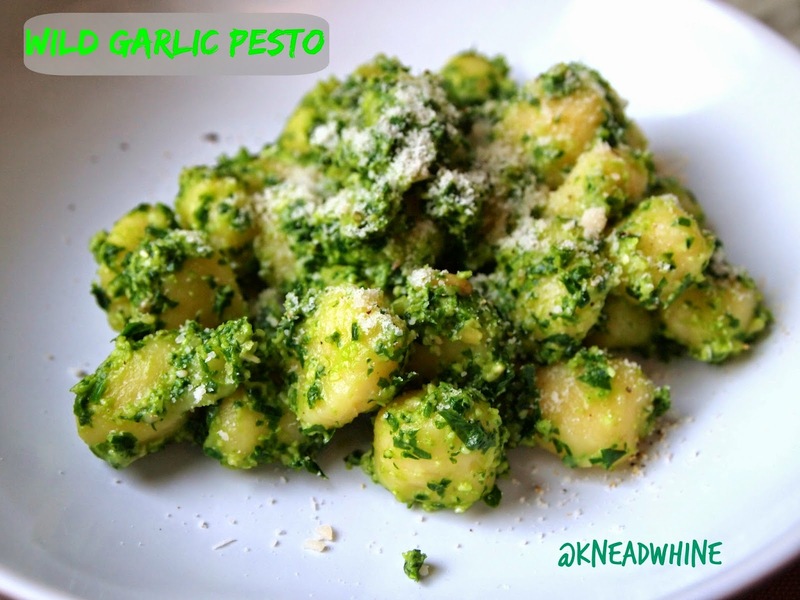 and gnocchi is one of D's favourite carbs (apart from chips.... which he might well get from me) it seemed a good idea to tempt him into the world of strong garlic. It was a partial success. I used a recipe from Jul's Kitchen but didn't realise that the recipe called for ricotta until too late. So we had it as is with a bit of parmesan over the top. D wasn't sure at first but did end up eating about half of his portion. He'd probably have benefited from the ricotta to tone the garlic down a little bit. In a small blender (or a pestle and mortar) blend the garlic leaves, pine nuts and salt, pulsing to try and dislodge ingredients at the top. Add the olive oil to taste and to slightly loosen up the mixture. Stir through the cooked gnocchi.